First Lady of Ghana Rebecca Akufo-Addo has unveiled the 2019 edition of the Silk Road Language and Art Exhibition. The exhibition carries forward Chinese art and culture, introduces foreign arts, and promotes international cultural exchanges. 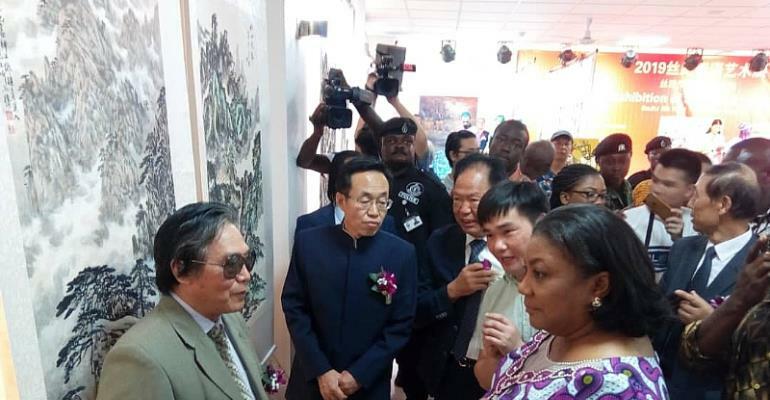 Ancient and modern Chinese art works and written languages were displayed inside the famous Confucius Institute Hall at the University of Ghana (UG) on Saturday, April 6, 2019. The exhibition is being organized by Greenhouse International Development Ghana Limited, a Chinese Group, and it seeks to among other things, promote cultural exchanges between Ghanaians and Chinese and as well promote a deeper understanding and appreciation of Chinese arts and language. A delegation of Chinese artists from the Chinese Behavioural Law Society, spearheaded the paintings and drawings during the opening ceremony of the exhibition. There was also charity activities by Chinese coinciding with the exhibition. The First Lady spoke about her remarkable impression with Chinese artistic works when she visited China along with her husband in September 2018. She traced the history of art in Ghana to ancient times, recounting how it has evolved over the years. The First Lady appealed that in the modern world, each country should treasure its cultural inheritance and learn from the cultures of others. In July 1960, Ghana and China officially established diplomatic ties. Since then, according to Ghana’s Ambassador to China, Edward Boateng, the Sino-Ghana relationship has remained solid and mutually benefitting. He noted that there were mainly three categories in Chinese painting namely landscape painting, figure painting, and flower-and-bird painting. Along the ancient Silk Road, he said, the skills and spirits of Chinese art spread, merge and develop with other civilizations. He added that “in the new age with the increasingly exchanges between China, Ghana and the world by the Belt and Road, Chinese traditional culture is not only the basis for artistic creation, but also the platform for cultural exchanges between China and the rest of the world.